Boulder City On Saturday, June 2, Boulder City residents and business owners will be able to hike and bike along a section of the new Interstate 11. City Council members voted unanimously to pursue staff’s recommendation for legal action to prevent city employees from being harassed during a special meeting Wednesday morning, according to City Manager Al Noyola. Possible litigation was discussed during a closed session after council members heard comments from three residents and the attorney of another. Though the exact harassment was never disclosed, a resident spoke during Tuesday night’s regular council meeting, claiming the council’s action wasd directed at him. “Mr. Noyola sent me a letter, had the audacity to have it delivered by a constable and woke me up. He accused me of threatening people by veiled threat and harassment,” said Neal Siniakin. Alex Shepard of Randazza Legal Group in Las Vegas, spoke on behalf of Siniakin at Wednesday’s morning, stating residents have a Constitutional right to express themselves as well as request information from city staff. Even multiple requests for the same information do not equal harassment, he said. Pursuing legal action for this “stymies citizens’ rights,” he concluded. Linda Barnett told council members that staff was never promised “smooth sailing” and that responding to citizens’ requests was part of their jobs. She also said the truth will always prevail and the city should have learned from its past legal proceedings with residents. “Stop shooting the messenger,” Barnett said, commending those who had the courage to stand up and say what they feel is right. Area residents are invited to an informational meeting at 7 tonight, May 24, for the new Neighborhood Watch program being organized by the Boulder City Police Department Volunteer Program in partnership with members of the community. The meeting will be held at Elaine K. Smith Center, 700 Wyoming St. Neighborhood Watch is a national program designed to fight crime and improve the quality of life in neighborhoods by forming partnerships between the police department and the community they serve. Members from the community and the police department will be on hand to provide information and answer questions. For additional information contact, Patrick Richardson, police support aide for the department, at 702-589-9603 or prichardson@bcnv.org. Residents, business owners and those who work in the city will be able to celebrate the completion of Interstate 11 with the upcoming Boulder City Day on Saturday, June 2. At this exclusive event, they will be able to hike and bike along the highway to a new scenic overlook from 6-10 a.m. Because this is an active construction site, participants will travel along the designated asphalt roadway surface and some places will require bicyclists to walk their bikes. The 5.8-mile one-way route offers a turnaround point at the 1.55-mile mark. Parking will be at the bridge near the south end of Buchanan Boulevard where the interstate crosses over. Reservations are required and can be made by emailing publicworks@bcnv.org. 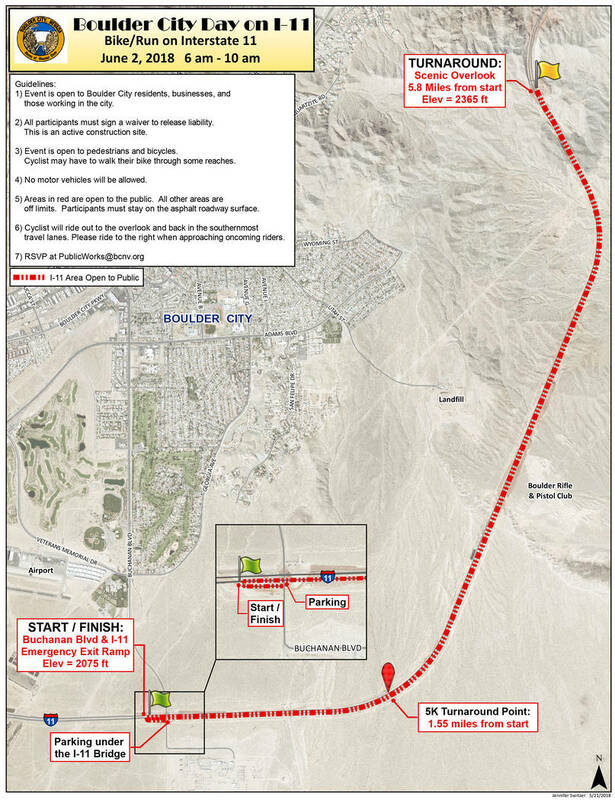 On Wednesday, May 23, the Nevada Department of Transportation opened a 2.5-long section of Interstate 11 between Foothill Drive in Henderson and U.S. Highway 95 in Boulder City. The $83-million I-11 Phase One project, which broke ground in late 2015, consists of building a full diamond interchange at Railroad Pass with a loop ramp, plus a 600-foot-long, two-lane, cast-in-place flyover bridge from southbound I-11 to eastbound U.S. Highway 93 toward Boulder City. Other project components include a new 1.5-mile-long asphalt frontage road linking Henderson with the Railroad Pass interchange, plus replanting 20,000 cactuses, placing decorative rock and installing 5 miles of tortoise fencing. Pieces of the new interstate opened in phases starting last year. The Regional Transportation Commission is still working on the remaining 12.5-mile second segment, which it expects to open at the end of July. I-11 marks the first new infrastructure to the Interstate Highway System since it was deemed complete Oct. 14, 1992, with the opening of Interstate 70 through Glenwood Canyon, Colorado.